I decided that I wanted to find out for myself what I really thought about this and have tried it both in the new default setting as well as in an adjusted mode more similar to the Windows Vista way. 2. Select the ‘Taskbar’ tab. As we can see from the screenshot above, active windows have labels and are looking different to non-active applications like the Outlook and Windows Media Player buttons above. Several open windows of one application is also separated, like we see with the Internet Explorer windows. What is the point? I think that this kind of old way is more cluttered and busy and not at all appealing to the eye and do not think that it is a better way to use the taskbar. Here we see that the ‘Internet Explorer’ active windows are combined and that there is a frame around the icon to designate that there are active windows. The non-active ‘Windows Media Player’ stands out since it is not emphasized with a frame and glossy look. It took some getting used to, but not too long, and I think that it definitely looks better than the so-called ‘Old Way’ I described earlier. It is basically prettier and I find it just as easy as before to glance at the taskbar to find what windows I have opened up. So there you have it… I actually think that Microsoft got this one right! 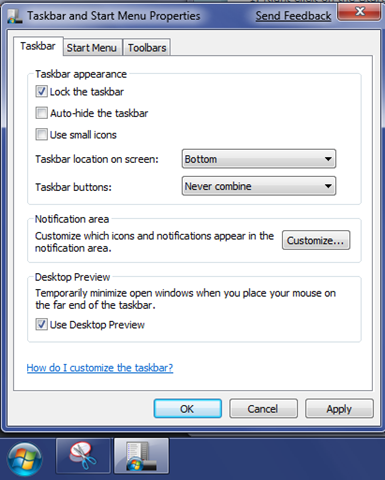 Slightly off topic: Paul linked to an article by Mike Halsey showing how to add a custom toolbar to the taskbar in order to get additional icons in there, like for instance the ‘Recycle Bin’. In this screenshot I have activated this feature and have added two often used applications and the Recycle Bin to this part of the taskbar. I like it, and advice you to try it out.